A brief look back at HPSN World 2016 -- the year's most anticipated Human Patient Simulation Network gathering. Packed with excitement, innovation and valuable networking experiences for simulation-in-healthcare enthusiasts, HPSN World 2016 offered a range of opportunity for attendees to learn from experts, mingle with colleagues and gain essential hands-on exposure to the latest advances in healthcare simulation. The conference convened from February 16 through February 18 at the luxurious Tampa Marriott Waterside Hotel and Marina. The Marriott Waterside is a gorgeous, bayfront hotel replete with elegant amenities and conveniently located in the heart of downtown Tampa. There was a mass casualty/outdoor disaster drill scenario, featuring pyrotechnics, Hollywood-grade special effects and realistic actors in a lively demonstration on how to transition trauma patients from the point of injury and triage, to evacuation and life-saving treatment. HPSN World 2016 provided the best in expert speakers. This year, there were two separate Keynote Sessions. 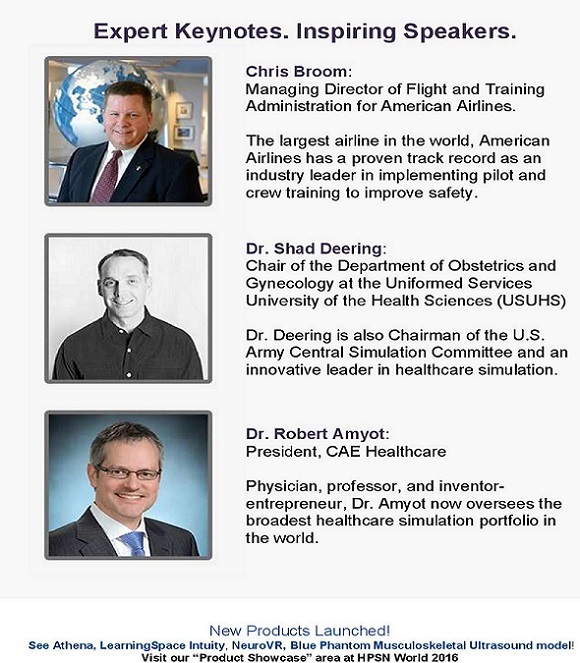 Chris Broom spoke on the synergy between aviation simulation and healthcare simulation. Dr. Shad Deering addressed motivations for becoming a healthcare simulation professional. Book-ended by CAE Healthcare President, Dr. Robert Amyot, all addresses were inspiring! Follow #HPSNWorld16 on Twitter to see more pictures and points of interest!